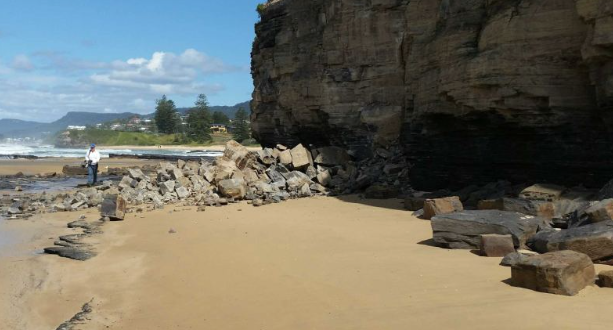 Signs are to be erected underneath the Austinmer headland, after tonnes of rocks crashed down last month, narrowly missing beachgoers below. Investigations are currently being carried out to ascertain the reason behind the rockfall right near the new Headlands Hotel development. Graham Charles is CEO of the Steven’s Group developing the headland. While their engineers are investigating, he is confident the slip was not related to construction works. He says the slip was not on their land and despite the work being carried out at the rocky outcrop, the fall looks to be the result of normal wear and tear. Council will erect warning signs in the area to make people below aware of the dangers of falling rocks.